'If we want to achieve a different society where the principle of money operates equitably, if we want to abolish the power money has developed over people historically, and position money in relationship to freedom, equality and fraternity ...then we must elaborate a concept of culture and a concept of art where every person must be an artist...' - Joseph Beuys. The world of finance exerts a huge influence over our lives, being responsible for economic turmoil and seemingly interminable peaks and crashes. Whereas money was once a simple means of exchange, today it is a commodity in itself and as 'capital' exerts power over individuals, degrading work to tradable labour. 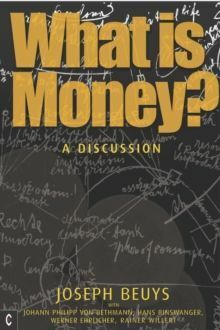 Can we find a new way of understanding money today, so that we can begin to overcome its destructive aspects? In November 1984, a remarkable discussion took place at the Meeting House in Ulm, Germany. It featured the radical artist Joseph Beuys, two professors (of Financial Sciences and Political Economics) and a banker. Beuys would appear to be out of place among these heavyweight academics, professionals and authors. But rather than being intimidated by his fellow panellists, Beuys - also a social and political activist - demonstrates his groundbreaking thinking on the subject, and his ability to bring fresh perspectives. Here for the first time is a transcript of this debate, together with analysis by Ulrich Rosch, which will be of equal interest to artists, economists and spiritual seekers.